March is a month packed with ed tech learning opportunities for teachers. The one we are most closely involved with is Silicon Valley CUE’s Teach Through Technology training event. There will be great speakers, fantastic learning opportunities, interesting exhibitors, door prizes, and food. It will take place at the beautiful Harker School in San Jose, on Saturday, March 8. Hands-on workshops include YouTube, Teaching & Learning on iPad, Digital Feedback, and Gamification in the Classroom. Presentation sessions include 1:1 Essentials, Blended Learning, Pinspiration, Google Drive, Screencasting, ELLs & the CCSS, and EdTech Info Security. We are excited to have a collection of new exhibitors this year, a number who are from the current Imagine K-12 cohort. 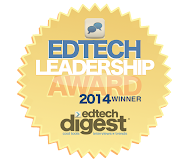 Included are EDpuzzle and Geddit, two companies recognized in the January issue of Tech& Learning top 100 sites of 2013. Also new is OpenEd, a nationally recognized open source lesson plan site highlighted this week in Edsurge’s newsletter. Be sure to check out Global Imagination, and their dynamic globes and maps. You may have seen them recently in the NewYork Times’ Science section. And there’s so much more. Pre-event registration ends 3/1. If you are in the San Jose area, please don't delay - get more info and sign up here. The price is low, and group rates are available.